The Eco-Villa was launched in the presence of His Highness Sheikh Dhiyab bin Mohamed bin Zayed Al Nahyan; His Excellency Suhail Mohammed Al Mazrouei, UAE Minister of Energy; His Excellency Dr Sultan Ahmed Al Jaber, Minister of State and Chairman of Masdar; His Excellency Sheikh Abdullah bin Mohammed Al Hamed, Head of the Energy Council and Member of Abu Dhabi’s Executive Council; and Mohamed Jameel Al Ramahi, Chief Executive Officer of Masdar, Abu Dhabi’s renewable energy company. 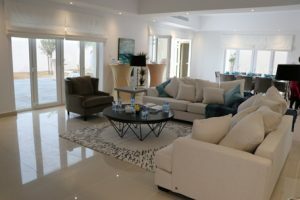 The 405 square-metre Eco-Villa is the first villa to achieve a 4 Pearl rating according to the Abu Dhabi Urban Planning Council’s Estidama Pearl Building Rating System. It will use around 72 per cent less energy and 35 per cent less water than a typical comparably sized villa in Abu Dhabi, displacing an estimated 63 tonnes of carbon dioxide annually. Fully equipped with 87 rooftop solar panels, the prototype is capable of supplying as much as 40,000 kWh of electricity to the national grid. A suite of passive energy and water-saving design features further reduce its impact on the environment. 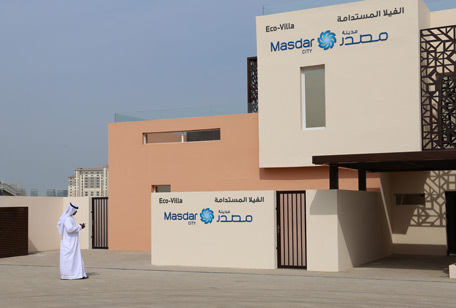 Once a family moves into the property, Masdar’s sustainability team will monitor the villa’s energy, water and waste management performance. The data collected will enable the design of the Eco-Villa to be further refined, supporting the eventual commercialisation of the building concept. Today, Masdar City is home to around 300 full-time students of the Masdar Institute of Science and Technology. All rights reserved to the initial publisher for lighter side of emirates247.